Following up the many stories I’ve done on the Southern California Edison Tehachapi Transmission Renewable Energy Project is a very important bill in the Utilities and Commerce committee today. AB 2235 by Assemblyman Curt Hagman, R-Chino, would authorize a property owner to seek compensation for any substantial reduction in property value proximately resulting from the building, expansion, or operation of a plant, line, pipeline, or other facility by a public utility. Why is this bill necessary? 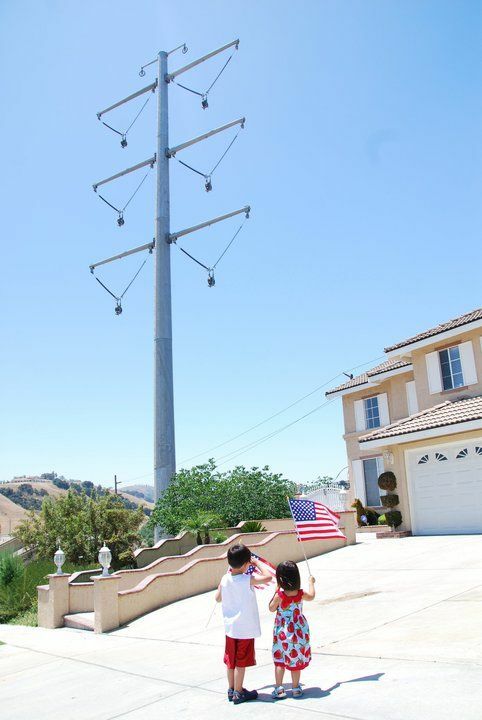 Because SCE has run roughshod over the residential communities in Chino Hills and built a string of 200 foot electrical transmission towers close to the homes. In addition to the housing crash in California, the homes in the lovely residential areas through Chino Hills have dropped in value substantially thanks to the ugly landscape which was not there when the homes were built, sold by developers and purchased by residents. Members of Hope For The Hills report that they have been told by several SCE insiders that the utility agreed long ago to build the towers, and have no intention of altering the plan. Some say that there was a contract signed with a cellular company for use of the towers. Others says that because the California Renewable Energy Portfolio was passed and signed into law by Gov. Jerry Brown, no California officials are going to help stop it. And others report that the project has been partially funded with federal stimulus money, which SCE doesn’t want to return. The group of residents tirelessly fighting SCE is purely grassroots, and they are a group of contenders. They have taken on the California Public Utilities Commission, and SCE with no resources other than their determination to save their community. And they are not NIMBY’s. Hope For The Hills, together with the City of Chino Hills, worked with attorneys and planners to come up with several alternative plans. So far, there have been a few compromises, but not enough. However, HFTH has the attention of Congressman Ed Royce, R-40th District, California. Approximately 450 – 500 people attended. For more information, the City of Chino Hills has a fantastic overview of the entire project. And of course, the many stories I have done provide a history. I will follow up on the results of today’s hearing. Now I understand why those people are so peeved. What an eyesore! Imagine getting up in the morning, looking out the window and seeing that humungous power pole in your front yard? Had that been my place they would have had to carry me off my property feet first before they planted that POC in my front yard. Royce is the congressman for Chino Hills? I don’t think so – but I could be wrong. Don’t count on Royce to fix the problem. About a year ago he voted to raise the debt ceiling and told us not to worrry – that the Stupid Committee would save us. The rest is history. So don’t let Royce sell you a bill of goods. Thank you Katy for another terrific article and for keeping this in the news. This bill is so important….I’ll never forget the feeling coming home from our Hawaiian vacation to a 198ft Monster power pole to greet us as our new view never having any idea this would be happening because we live far away from the easement yet are “visually impacted” by this gross injustice SCE has bestowed upon us. We also have a 265ft power pole as a view from our kitchen window and in our backyard. Never even given a chance to think about moving ahead of time or mentally preparing for such mutilation to the area we so carefully sought out to live in. Who will protect YOU? This bill is very important. This can’t keep happening. It’s devastating. Once again Katy….THANK YOU!! I pray one day soon you can write the finale with David beating Goliath. This has been an ongoing battle of will and with the relentless drive by so many dedicated, devoted, intelligent and creative individuals, we have persevered in ways most thought was impossible. We’re not going to back down; it’s our life and we deserve better than what these GREED driven corporations have in store for us. Thank you Katy!! This organization has demonstrated both courage and persistence in it’s refusal to sacrifice it’s people and property to the current SCE management. The members are in complete support for any and all efforts at progressive energy independence. The SCE engineers and management that callously wrote off our city as collateral damage plan on not only ruining our property values and beautiful landscape with their power poles but even expose out children to devastating health risks in the future. They wouldn’t live under these towers or place their own children in harm’s way, how can they do this to our families? Edison’s board of directors needs to take a long and hard look at the character and intelligence of their management. The last couple of years has exposed a litany of disasters due to their incompetence from Malibu’s fires to Temple City’s extended loss of power. Their cutting corners now includes the San Onofre power plant… is it any surprise that the Hope for the Hills organization is trying to stop this debacle of 500KV lines within 70 feet of children’s bedrooms? Thank you Ms. Grimes for helping us keep a light on this potential disaster and pray that we succeed. Thank you Katy for following our plight here in Chino Hills. With the tenacity of a group of community activists, we have turned many heads and have made state regulators take a second look at this Project. Our City and some politicians have helped us to get where we are at today. We are hoping to turn this Project from being “Profit over People” to “People over Profit.” And I do believe we should know the outcome of all our effort soon. Thank you again Katy! Thank you, Ms. Grimes for continuing to tell the story. At the conclusion of the Congressional Hearing on April 14, Ed Royce pointed out to the SCE representative the opportunity to avoid creating a disaster in Chino Hills that might show up much later (e.g. Leukemia and other cancers developing in residents near these lines) similar to the environmental destruction that led to the Superfund cleanups since the ’80’s. Inflicting this project on Chino Hills in this way has never made any good common sense, and it is time that community health takes the priority in these discussions so the disaster that Ed Royce mentioned is avoided. Great job Katy for bringing this story to the people. 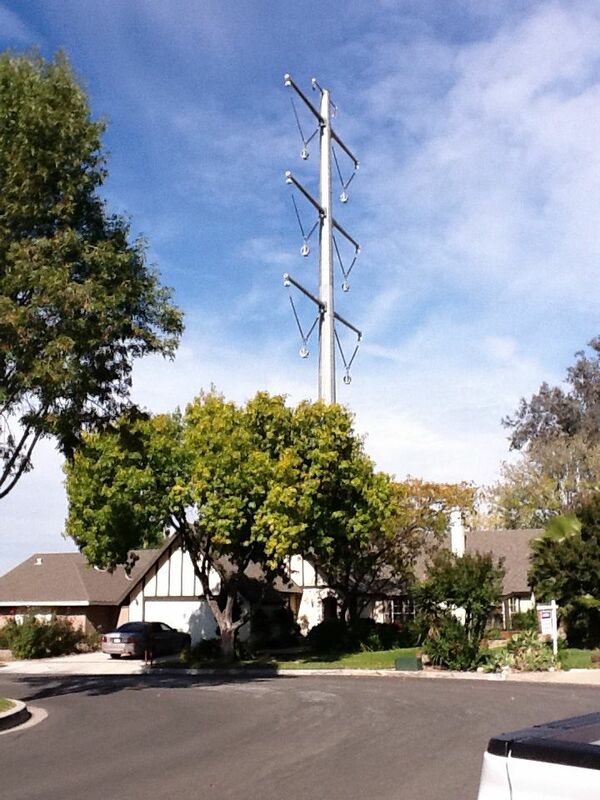 I don’t live in Chino Hills but I am disgusted by SCE (as anyone who has seen these towers should be)! How would any company think that it would be acceptable to place these deadly monsters in any community? They are too close to homes which makes every home nearby a danger to live in. The health impact alone from the EMT’S is enough to make people walk away from their homes, and the fact they are 200 ft. high in an easement that is only 145 wide makes every home in the fall zone of these things. I wish every person reading your story would go and take a look at these poles for themselves. It’s not only Chino Hills at risk. In my opinion, if it could happen there, than who’s next? Royce talks a good game (ie. balanced budget and debt ceiling). Get back to me when he actually accomplishes something, will you??? Wonderful article Katy. While construction continues to be halted in Chino Hills, our property values continue to plummet. Even with record low prices homes are failing to sell. SCE’s segment running through the heart of Chino Hills,if allowed to remain above ground will cast a shadow of sickness, danger and financial ruin over more than 1,000 homes and 4,000 men, women and children. It has been through the media exposure of articles like this that Hope For The Hills has been able to make progress in our battle to have SCE underground the 500kv lines that will otherwise be strung over head. Today our future rests in the hands of the CPUC and I pray that the five commissioners will end this dangerous insanity and protect the health and safety of Chino Hills. Thank you from the bottom of my heart. This says it all. Voters be careful what you wish for and who you VOTE for. Others say that because the California Renewable Energy Portfolio was passed and signed into law by Gov. Jerry Brown, no California officials are going to help stop it. And others report that the project has been partially funded with federal stimulus money, which SCE doesn’t want to return. Thank you Katy for following up on the green energy travesty. Apparently there is little interest in our health, safety and future by most of our California representatives, and most of all, Governor Brown. It’s a shame he will not respond to our letters, or address our concerns. He remains silent. We see the devastation in Redondo Beach, where families are sick and have abandoned their homes because of Edison and its “Stray Voltage”. Who is protecting them? Who is next? The citizens of Chino Hills want to make sure this will never happen to any other community in America. Please continue to keep your readers abreast of our situation. We vow to fight for the health of our families. Chino Hills was a backwater adjacent to the gates to Heckla…. And you do not have Senator Kennedy to blow away windmills!!!! Unfortunately…..some did not do their homework..
“This is no whining group of NIMBYs.” Ummm, yeah, they are. I used to live in Chino Hills and the derisively termed Chino “Flats.” Hey you snotty punks in the 91709. Hope you enjoy the fact that you’re livin near the old cow pastures. Hope you enjoyed the loss of property values when The Shoppes at Chino Hills moved in. Remember Chino Prison? How about Kevin Cooper’s murders in 1983? Prado Flood Plain anyone? Hope you like the Chino Airport flight path. Anybody feel that earthquake in OC today? 3.9 I heard it was centered in San Juan – not far from San Onofre. That’s a comforting though, eh??? You problem with power lines are a total nothingburger compared with damaged nuclear reactors. You want to see panic? Wait until there’s a 8.0 earthquake in San Juan. You will see people sprinting up the side of the Santa Ana Mountains like Jesse Owens. I happened to be at the library today when it hit. I was glancing at the books on the economics shelf when the overhead lights just starting rattling as if they were going to break apart and fall. I looked up but didn’t move. I figured if it was my time it was my time. An old woman (she must have been 75) about 10 feet away from me literally dove under a wooden table. It was pretty hilarious actually. I bet that’s the fastest she’s moved since the day they called her name at the social security administration office to sign up for her retirement and medicare benefits. After the lights stopped shaking I walk over and peeked under the table and asked “You okay under there?” She asked “Is it over?” As I helped her up I said “This was only a rehearsal. You did good”. She smiled. SCE has no regard for human life! Don’t understand why SCE will not seek the alternative route through the state park, or go underground like other utility companies are doing in other countries. This is outrageous! If SCE prevails, the amount of EMFs and stray energy will not only decline property values, but hurt people. Yeah, it’s NIMBY. These guys found some really bad EMF webpages that said EMF is bad! You will all DIE! and attached themselves to it because it makes their complaints look a little more complex than ‘it’s ugly!’. Anyone with basic critical thinking skills or any post-high school science can tell that their sources for this are less reliable than just asking an 8-ball, but they have all decided that despite any actual evidence, the power lines will make them all sick. They’ll use any excuse. Hell, my house has gone down in value since the lines went up too! I don’t live within 50 miles of them. End of subject. Easements and cows have consequences!!! Those 2 little kids in the photo are sure getting a lesson in the “American Dream”, aren’t they? This is the kind of stuff that turns kids into radicals. Planting a 20 ton power pole with hotwires attached in a homeowner’s front lawn is not nice. Not by any stretch. Then they wonder why the majority of the people hate government and it’s by products. Mr. Queeq, and all the other negatives: Actually, we have a very educated bunch of people in this group who are on top of this issue and have done their homework. This isn’t only about Chino Hills, but about the bullying that is being done by monopolizing utility corporations across the country. I’d say that the negative comments on this article are probably utility workers wives or employees trying to stir the pot a bit, as they’ve tried to do in the past. Try telling the mother who has brain cancer and was told to move by her doctor because these 500KV lines above her home will put herself and family more at risk, try telling the people who have been told by their doctors that if they have anyone in their family that has a pacemaker that they should move, try telling the Redondo Beach families who have been sick since an electric substation was put up in their backyards that this is a NIMBY issue. I can go on and on. You people make me want to fight harder because of your own ignorance. Thank you Katy, once again, for showing your continued support of this issue. There’s so much people still need to learn. Doctors aren’t always right, and current research does NOT show any correlation between health and EMF. Correlation is not causation, by the way. Excellent job Katy! Thanks so much for your continued support in educating the public about this! Thank you Katy for your article. You have been instrumental in this battle of ours since inception. We do appreciate you getting the word out to everyone that would read and understand what we are going through. We are worried sick about our family and our future. Keep up the great work! Ms. Grimes thank you once again for this article. Chino Hills residents will not stop fighting this travesty. We really wish people will just stop, think and pray for us who are affected by this, instead of saying things that are so hurtful. We are hurting already! Thank you. Thank you Katy for your continued support and not giving up on the people from Chino Hills. We continue to pray and fight to take down these awful towers and with the help of wonderful supporters like yourself we are motivated to persevere our fight until the end! Thank you, thank you, Katy. You have done it again. Please continue fighting to right the wrongs you see. You are invaluable to “little guys” like us. You give us support and hope…. Thank you Ms. Grimes for your continued support in reporting on the progress of the fight by the residents of Chino Hills against the monster towers put up by SCE. We will fight till SCE pack up their towers and leave our city very soon. Bullet train: Is L.A. Times’ beat reporter ashamed of edit page?